Summary: A groundbreaking new study that looked at brain samples from humans with Fragile X reports the window for treatment remains open well into maturity. Broader potential target for therapy in nerve cells also found in Drexel study. Brain samples from humans show that the treatment window for Fragile X syndrome likely remains open well into maturity after childhood, when previous tests with mice indicated it might close, according to a new Drexel University-led study. This new information could become valuable as therapeutic treatments for Fragile X syndrome — the most common autism-related disorder which results in intellectual disabilities and impacts one in every 4,000 males and one in every 8,000 females — are still being developed in clinical trials. 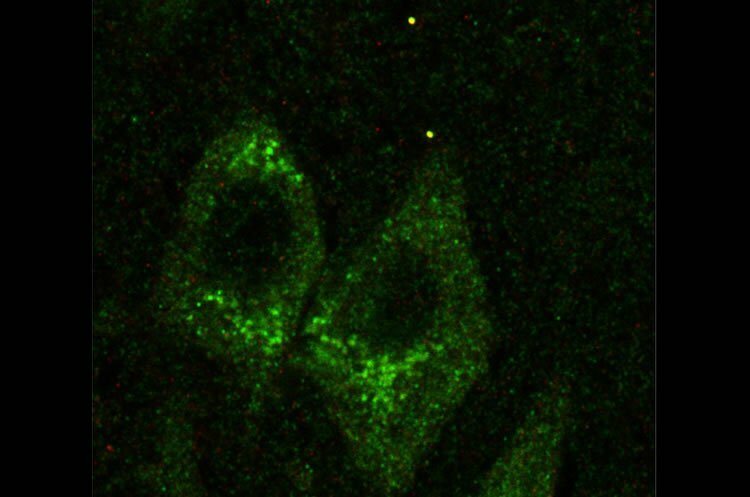 Michael Akins, PhD, an assistant professor in Drexel’s College of Arts and Sciences, led a team that found structures called Fragile X granules in the part of the brain that controls memory, the hippocampus, well into maturity in both rat and human specimens. The granules, which Akins helped discover in 2009, are thought to contribute to Fragile X syndrome when they become decoupled from a gene called FMRP (Fragile X mental retardation protein) that is mutated in Fragile X patients. While Fragile X granules were found in the brains of adult rats and humans, they seemed to disappear in mice when they reached maturity. “It’s intriguing that this disease-related gene has different expression patterns in humans than in the major preclinical model, mice, that are used to study that gene,” Akins said. As a result, most studies would have missed the evidence of these granules in adulthood because they used mice. Finding that Fragile X granules linger in the hippocampus of adult humans could expand the age range for treatment. In Akins’s study, one human brain sample, from a person 57 years old, showed evidence of the granules. This suggests that treatment could be applied into adulthood, not just during childhood. Moreover, they also found that treatment might need to target the nerve cells that house FMRP and Fragile X granules more broadly. These cells, called neurons, have two parts — dendrites and axons — that relay information in the brain. Most research focuses on the FMRP in the dendrites — the information receivers. But past research by Akins and company showed that FMRP was also found in Fragile X granules in the axons — the information senders. However, what the FMRP was doing in these axon granules was not known and work from several other labs suggested that the FMRP in axons might be quite different from the FMRP in dendrites. Sections of the hippocampus of a 44-year-old person that show Fragile X granules (the bright points at the top of the image) and neuronal cell bodies (the green structures) with FMRP localizing to both. NeuroscienceNews.com image is credited to Michael Akins. In the new study, Akins and colleagues gained insight this. They found that FMRP in axons shares some unexpected similarities to the FMRP in dendrites. This means that therapies that target those similarities might fill in for the lost FMRP in both parts of the cell. This could be an important development because half of those with Fragile X syndrome could also be diagnosed with autism spectrum disorder. Developments in therapy for Fragile X might play a role in treating symptoms in other types of autism, too. With evidence pointing toward a longer timeframe for possibly effective treatment and a whole new pathway for delivering it, Akins hopes to continue solving the machinations behind Fragile X syndrome. Funding: National Institutes of Health funded this study. Image Source: NeuroscienceNews.com image is credited to Michael Akins. Drexel University “Treatment Window for Fragile X Likely Doesn’t Close After Childhood.” NeuroscienceNews. NeuroscienceNews, 20 March 2017. Drexel University “Treatment Window for Fragile X Likely Doesn’t Close After Childhood.” http://neurosciencenews.com/fragile-x-treatment-window-6267/ (accessed March 20, 2017). Local mRNA translation in growing axons allows for rapid and precise regulation of protein expression in response to extrinsic stimuli. However, the role of local translation in mature CNS axons is unknown. Such a mechanism requires the presence of translational machinery and associated mRNAs in circuit-integrated brain axons. Here we use a combination of genetic, quantitative imaging and super-resolution microscopy approaches to show that mature axons in the mammalian brain contain ribosomes, the translational regulator FMRP and a subset of FMRP mRNA targets. This axonal translational machinery is associated with Fragile X granules (FXGs), which are restricted to axons in a stereotyped subset of brain circuits. FXGs and associated axonal translational machinery are present in hippocampus in humans as old as 57 years. This FXG-associated axonal translational machinery is present in adult rats, even when adult neurogenesis is blocked. In contrast, in mouse this machinery is only observed in juvenile hippocampal axons. This differential developmental expression was specific to the hippocampus, as both mice and rats exhibit FXGs in mature axons in the adult olfactory system. Experiments in Fmr1 null mice show that FMRP regulates axonal protein expression but is not required for axonal transport of ribosomes or its target mRNAs. Axonal translational machinery is thus a feature of adult CNS neurons. Regulation of this machinery by FMRP could support complex behaviours in humans throughout life.